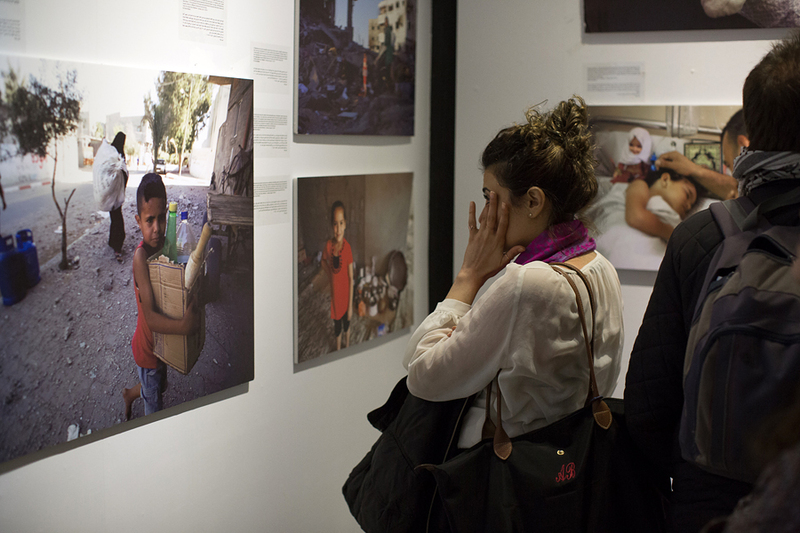 Photo Exhibition "Children of Palestine | Beyond Numbers" at Khalil Sakakini Cultural Center in Ramallah, from Wednesday, March 18 to Monday March, 30, 2015. 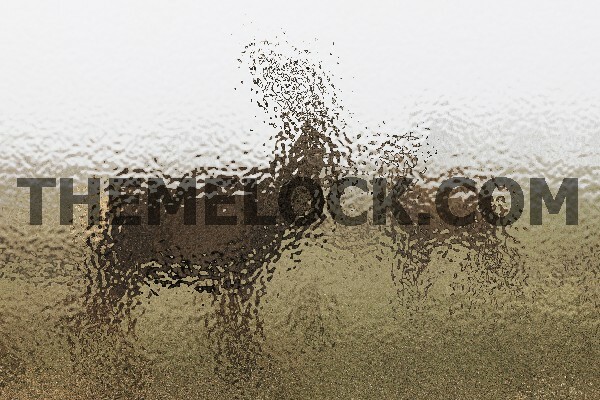 Opening event on Wednesday, March 18 from 5:30 to 8pm / Open daily from 9am to 4pm. 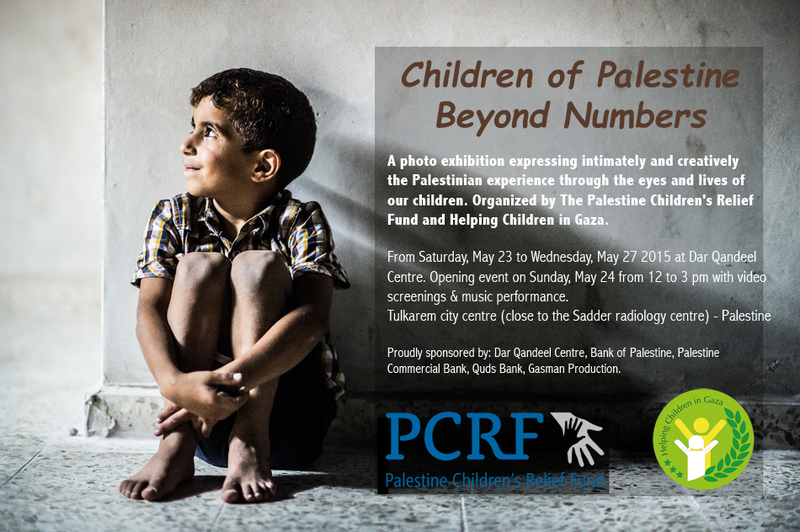 Staged by The Palestine Children’s Relief Fund (PCRF) and Helping Children in Gaza (HCIG) “Children of Palestine | Beyond Numbers” brings together pictures taken by a variety of talented photographers, as well as by the children themselves. The combination of photos taken by children and by professionals, as well as by Palestinians and by internationals, gives this exhibition its unique perspective through diverse documentation of experience. 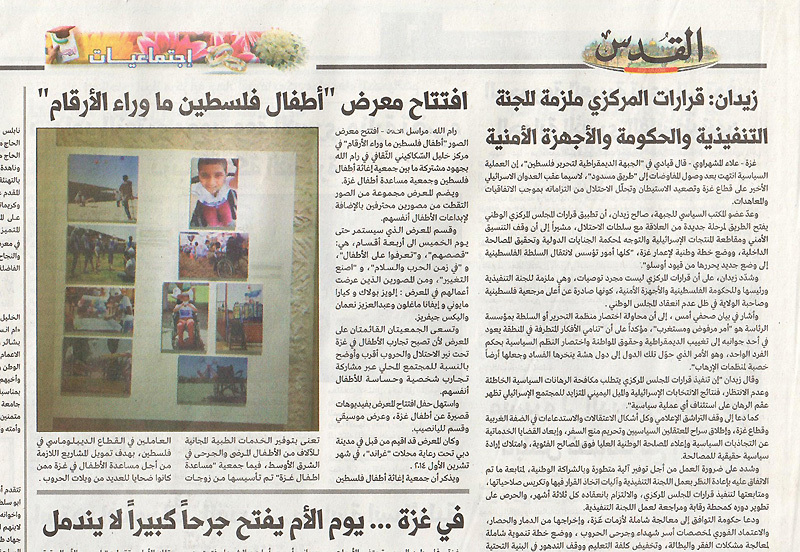 This project expresses intimately and creatively the Palestinian experience through the eyes and lives of our children. Palestinian children live under extreme conditions of an occupation and through the horrors of many wars, yet they are very much like other children - they enjoy playing, being creative and they love taking pictures. The photo exhibition is made up of four themes: Their stories, Meet the Kids, In Times of War & Peace, Make a Difference; and it showcases the work of photographers: Eloïse Bollack; Alex Jeffries, Ivana Maglione; AbdelAzeez Noman, Sarah Alrayyes. By sharing an intimate perspective of the lives of Palestinian children through photography, PCRF & HCIG hopes that the community might come to a better understanding of the children’s challenges and their unwavering spirits. Through empowering, collaborating and learning together we aim to build a sustainable future for our children. “Children of Palestine | Beyond Numbers” was staged at Gulf Photo Plus Gallery in Dubai and sponsored by Grand Stores Dubai. On January 31, 2015, PCRF & HCIG hosted the very first Fundraising Gala for Gaza at St. George Event Hall & Convention Center in East Jerusalem gathering representatives, ambassadors and members of the Palestinian private sector. We would like to acknowledge our generous and supportive sponsors and contributors: Khalil Sakakini Centre, Bank of Palestine, Palestine Commercial Bank, Quds Bank Gasman, Azure restaurant, Shadi Zaqtan, Edward Said National Conservatory of Music, Royal Jordanian Airlines, Movenpick Hotel Ramallah, St. George's Hotel East Jerusalem, Zainab Gallery Ramallah. The Palestine Children's Relief Fund is an apolitical nonprofit humanitarian medical relief organization providing free medical care to thousands of sick and injured children from the Middle East. In 2013, PCRF sponsored 81 volunteer surgery missions in the Middle East, providing 1495 operations for needy children. In addition, 63 children were sent abroad for free medical care that they could not get locally.